In marshy shallows, three male sea gods battle each other and two water satyrs. 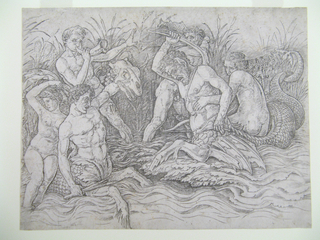 The water satyr on the left, armed with a club and a monster's head, is carrying a sea nymph on his back, who looks away from the battle in fear. The sea satyr on the right is armed with a hatchet and struggles to resist the grip of a sea god behind him. Meanwhile, another sea god blows a horn to rouse the spirits of the fighters, while the third is whacking left-and-right at the sea-satyrs with two fish. In the rushes in the background, serpents and sea creatures lurk.